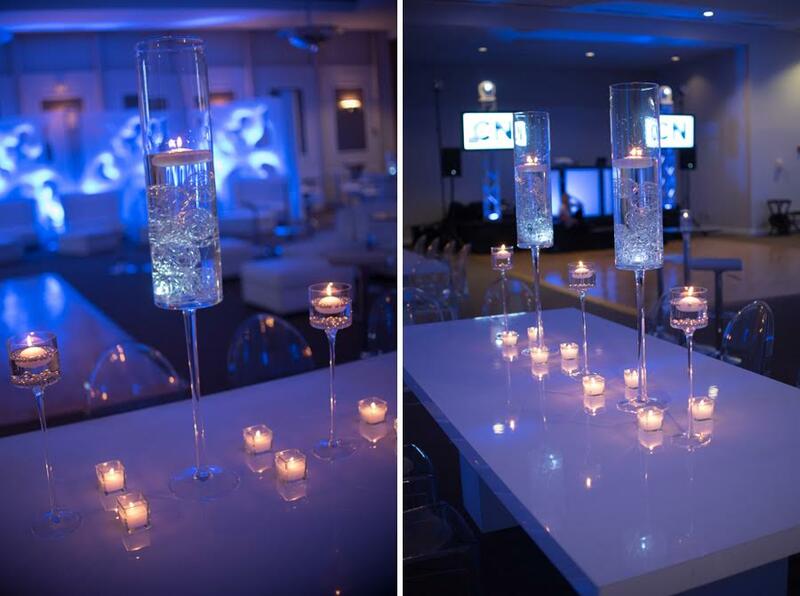 Traditionally many of the mitzvahs we create for families want all the bells and whistles, However, this special Bar Mitzvah family wanted to keep it simple. As always, we love giving our clients everything they ask for and so much more. In this case, we kept the details to a minimum, but still delivered a top notch affair. 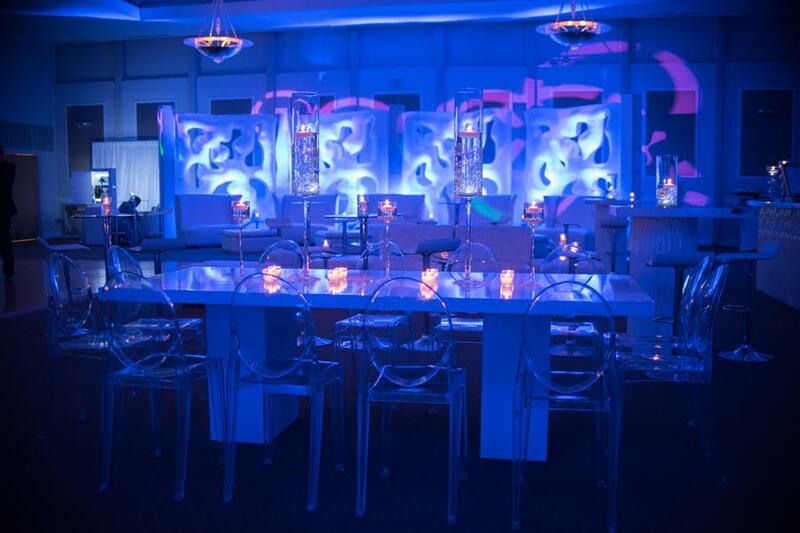 Galaxy Productions agreed with our vision of “less is more” as they transformed the ballroom at Temple Beth El of Hollywood into a clean, sleek and chic club-like space. Instead of having multiple tables for a sit-down dinner, we had stations placed around the room. This allowed for many high top cocktail tables, a couple royal tables with ghost chair seating and a fantastic bar. 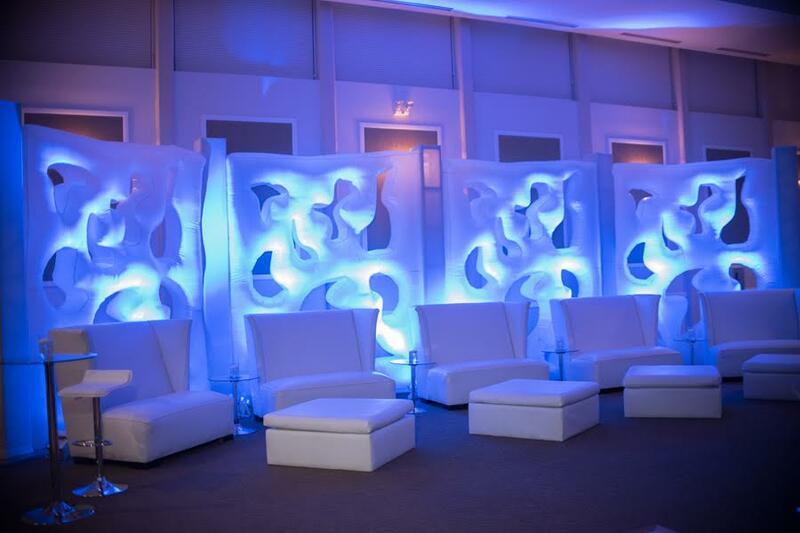 White leather winged couches lined an inflatable light-up wall, so guests could move about the room with ease. We set staging on risers so Pure Energy had plenty of freedom on the dance floor. Of course, no event is complete without the proper lighting. The blue glow finished the entire look for Connor’s big night. It may be one of the older synagogues in Broward County, but its warm environment with a true neighborhood feel added to the ambiance of this mitzvah celebration. Keeping it real always makes a STYLED event. Mazel Tov to Connor and his family! For more information on Jennifer Keller Styled Events, please visit our website, like us on Facebook and follow us on Twitter and Pinterest.